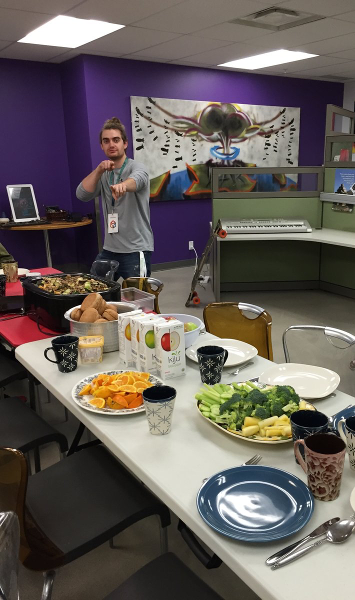 SHINE Youth currently operates as an outreach service at the Armoury Resource Centre. We run a weekly program at the Armoury called Cookin’ with SHINE In the past, SHINE ran Cookin’ with SHINE along with Friday Night Challenge out of iHuman Youth Society. iHuman created FNC to give the youth a healthy and constructive activity to participate on Friday nights. The goal is to provide a sober alternative for the youth that may otherwise participate in activities related to alcohol and drug use. SHINE started volunteering at FNC during the summer of 2014. Currently, SHINE sponsors one event per month at iHuman, which provides the youth with opportunities to engage in fun and meaningful activities around the Edmonton area. Volunteers from the University of Alberta focus on a holistic health approach; educating the youth on health promotion and disease prevention strategies. Some of the activities we have done so far include gingerbread decorating, a visit to Latitude 53 (which hosted an exhibit on the criminalization of HIV), and an Oil Kings game. In the new year, FNC will have a focus on a culturally sensitive approach to recovery. The youth at iHuman have expressed their gratitude and how impressed they are with our work so far. For this, we thank all of our volunteers and preceptors for their amazing work! In September 2016, SHINE started a new program at iHuman called Cookin' with SHINE. We cook with the youth at iHuman and involve them in all steps of the process: selecting recipes, buying ingredients, and cooking meals. We hope the program will foster an environment for the youth to assume responsibility for tasks, and acquire skills that help them transition into adulthood and gain independence. We also plan to have bi-annual workshops with chefs of Indigenous background or who have overcome addictions to provide insight on how food and meal sharing has assisted them in their path to recovery. We believe the new food program will help provide recipes for youth with food allergies or intolerances as well as vegan and vegetarian options that are both affordable and well balanced. Cookin' with SHINE will also serve as a platform for volunteers to spend time with the youth on a more intimate level. By increasing our involvement at iHuman, SHINE students will have more opportunities to build meaningful relationships with the youth. SHINE Dentistry is a non-profit dental clinic operated by the dental students of the University of Alberta. Based out of the Boyle McCauley Health Centre, the clinic runs most Saturdays throughout the year and provides free dental care to low-income and inner-city youth. Dental work is performed by volunteer dental students, who are assisted and supervised by licensed dentist preceptors. The mission of CHIUS is to provide an exciting, dynamic and innovative program that emphasizes the development of mental, emotional, social and physical well-being of all participants in a safe and welcoming environment. Our inter-professional team focuses on diminishing barriers to health care, establishing strong partnerships, and enhancing the community’s perception of health care. SWITCH’s vision is to maintain an operating, interdisciplinary student-run health clinic in conjunction with health professionals and community partners to serve clients in Saskatoon’s core neighbourhoods. Our vision for the WISH Clinic is that it will provide non-judgmental, socially responsible, holistic health care to a population that struggles with poorer health than the rest of the city.